Seeking out new markets in emerging countries and staying resilient in traditional ones, Russian arms companies are on the rebound. Russian weapons manufacturers are wearing big smiles these days. And why not! Spurred by big-ticket sales to China, while also opening up new markets in Iraq, South Africa, Afghanistan and Egypt, Russian arms sales have shot up by 20 per cent, even as global arms sales by the world’s top 100 armaments companies fell for the third year in a row. New data compiled by the Stockholm International Peace Research Institute (SIPRI) shows significant increases in arms sales by Russian companies and other emerging suppliers. 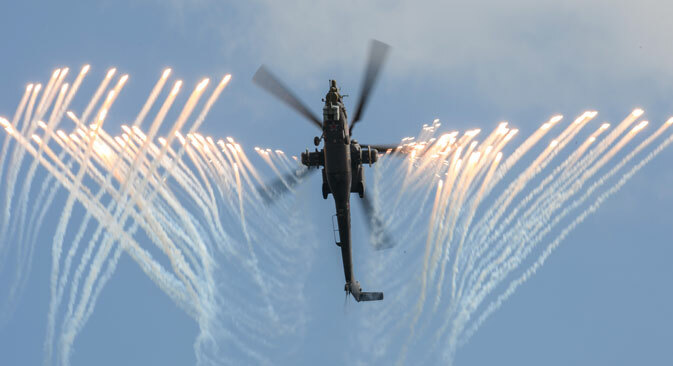 The Russian company with the largest increase in sales in 2013 was Tactical Missiles Corporation, with a growth of 118 per cent, followed by Almaz-Antey (34 per cent) and United Aircraft Corporation (UAC, 20 per cent). Although UAC – the Russian holding company which includes Irkut, Mikoyan, Sukhoi, Ilyushin, Tupolev, Beriev and Yakovlev – has not officially released any figures, media outlets report that Russia has surpassed the US in the number of combat aircraft produced. Almaz-Antey’s arms sales in 2013 make it the 12th largest arms producer (excluding China) and bring it closer to the top 10, which has been the exclusive club of arms producers from the US or western Europe since the end of the Cold War. Currently, 10 Russian arms producing and military services companies are ranked in the SIPRI Top 100, compared with nine companies in 2012. “The remarkable increases in Russian companies’ arms sales in both 2012 and 2013 are in large part due to uninterrupted investments in military procurement by the Russian Government during the 2000s,” says Siemon Wezeman, Senior Researcher with the SIPRI Arms and Military Expenditure Programme. However, one area SIPRI hasn’t covered is weapons deals under the radar. Military sources in Russia suggest the real volume of arms sales is even bigger than SIPRI suggests, as the institution only uses information provided by open sources, Kommersant says. Other agree. “The workings of Russian defence trade remain largely a mystery, except to a handful of specialists,” says UPI. Take Russia’s surge back into the Iraqi arms market, where once it was the undisputed leader. After the US invasion, weapons contracts were liberally – and illegally – doled out to mostly American arms makers. In a naked display of neo-colonialism, the occupying American administration forced the Iraqis to buy billions of dollars worth of weapons they didn’t want. The Russians were completely shut out of Iraq. However, after nearly a decade of being jerked around, Iraq had had enough. In October 2012 Baghdad signed a $4.2-$5 billion deal with Russia’s Rosoboronexport. The deal was reported to include a wishlist that included 30 Mi-28 attack helicopters and up to 50 mobile SA-22 Pantsir air defence systems. Traditionally, Middle Eastern countries have split their weapon buys between different suppliers in order to reduce dependence on one country. Iraq and Egypt are now following this trend. The only problem is Iraq may have to ensure a separate supply chain for spare parts because Russia hasn’t quite sorted out its supply bottlenecks. But that’s not really a deal breaker. “Iraq may have fewer attack helicopters in the air at any one time, but at least it won’t become zero,” says DID. Like Iraq, Egpyt is another major Russian client that’s returning with a high-octane shopping list that included the latest MiG-35 fighter bombers. Earlier this year, the country’s army chief Abdel Fattah al-Sisi was in Moscow to negotiate a $2 billion arms deal. China seems to have an insatiable appetite for Russian weapons. Moscow has cranked up production of the S-400 wonder weapon, the Su-35 Super Flanker, and jet fighter engines that Beijing wants. Russia may sell even strategic weapons to China in response to further economic sanctions. Plus, India continues to be among Russia’s leading buyers. New Delhi plans to splurge over $100 billion on high-end weapons and Russian manufacturers are hopeful of bagging some of the deals. At the same time, a lot of Russia-India deals are secretive – such as the lease of a second nuclear powered submarine from Russia and the consultancy services being provided to India’s Arihant ballistic missile nuclear submarine. Being a major supplier to two of the largest emerging markets in the world is hugely advantageous to Russia. For, the chances of a slowdown in arms purchases by China and India are unlikely as both countries are flush with cash and on a military modernisation drive. In view of the surge in defence production in developing countries worldwide, SIPRI has a new category of Emerging Producers. This is aimed at addressing the “growing importance and ambition of arms-producing companies that are based in countries in the Global South”. Collectively, Brazil, India, South Korea, Singapore and Turkey represent a small part of total Top 100 arms sales, but increases in arms sales—as well as the significant goals set by these countries’ governments both in terms of indigenous production of armaments and export strategies—call for better tracking of their trajectory in the ranks of top arms producers. The report shows that of emerging producers ranked in the 2013 Top 100, India has the second highest number of companies (three), showing equivalent sales to those of the five ranking South Korean companies. “Even though successive Indian governments have stated their intention to develop a comprehensive, technologically advanced indigenous arms industry, India’s capacity to reach that goal remains questionable,” says SIPRI.